The most massive galaxies may have formed billions of years earlier than current scientific models predict, according to surprising new research. "We have found a relatively large number of very massive, highly luminous galaxies that existed almost 12 billion years ago when the universe was still very young, about 1.5 billion years old. These results appear to disagree with the latest predictions from models of galaxy formation and evolution," said Danilo Marchesini, assistant professor of physics and astronomy at the Tufts School of Arts and Sciences. "Current understanding of the physical processes responsible in forming such massive galaxies has difficulty reproducing these observations." The newly identified galaxies were five to ten times more massive than our own Milky Way. They were among a sample studied at redshift 3 to 4, when the universe was between 1.5 and 2 billion years old. By complementing existing data with deep images obtained through a new system of five customized near-infrared filters, the researchers were able to get a more complete view of the galaxy population at this early stage and more accurately characterize the sampled galaxies. still young, according to surprising findings from Tufts' Danilo Marchesini. The researchers made another surprising discovery: More than 80% of these massive galaxies show very high infrared luminosities, which indicate that these galaxies are extremely active and most likely in a phase of intense growth. Massive galaxies in the local universe are instead quiescent and do not form stars at all. The researchers note that there are two likely causes of such luminosity: New stars may be forming in dust-enshrouded bursts at rates of a few thousand solar masses per year. This would be tens to several hundreds of times greater than the rates estimated by spectral energy distribution (SED) modelling. Alternatively, the high infrared luminosity could be due to highly-obscured active galactic nuclei (AGN) ferociously accreting matter onto rapidly growing super-massive black holes at the galaxies' centres. There might be an explanation that would at least partially reconcile observations with model-predicted densities. The redshifts of these massive galaxies, and hence their distances, were determined from the SED modelling and have not yet been confirmed spectroscopically. Redshift measurements from SED modelling are inherently less accurate than spectroscopy. Such "systemic uncertainties" in the determination of the distances of these galaxies might still allow for approximate agreement between observations and model predictions. If half of the massive galaxies are assumed to be slightly closer, at redshift z=2.6, when the universe was a bit older (2.5 billion years old) and very dusty (with dust absorbing much of the light emitted at ultra-violet and optical wavelengths), then the disagreement between observations and model predictions becomes only marginally significant. However, the discovery of the existence of such massive, old and very dusty galaxies at redshift z=2.6 would itself be a notable discovery. 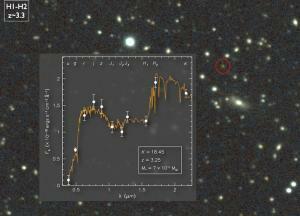 Such a galaxy population has never before been observed. "Either way, it is clear that our understanding of how massive galaxies form is still far from satisfactory," said Marchesini. "The existence of these galaxies so early in the history of the universe, as well as their properties, can provide very important clues on how galaxies formed and evolved shortly after the Big Bang," he added.